Our team here at Smith of Derby have had another busy summer, both in the works and out on various sites across the UK. All departments have been working hard during this heatwave on many different projects, with the odd ice cream being enjoyed along the way! Our traditional sector has been extremely busy with many different jobs taking place, both in the works and by our engineers across the UK. 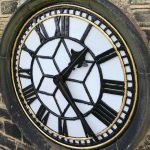 Our engineer Matthew Smith recently completed various works on a local church clock. The client, who happens to be a Fellow of the British Horological Institute (FBHI) and has an MBE for services to clockmaking, gave some great feedback and enquired about further works! 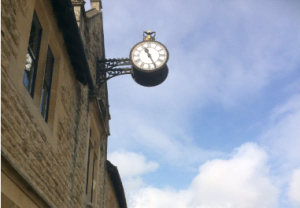 A full clock restoration was carried out for the iconic time piece at Costwolds Hall, Northleach. The clock, which has a distinctive crown top, was originally made in 1897 by Smith of Derby to celebrate Queen Victoria’s Diamond Jubilee. 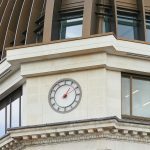 Following a full restoration, the clock was installed back on the Hall’s exterior in early August and sits proudly overlooking the towns West End once again. The restored clock at Cotswolds Hall, Northleach. One of our apprentices, Annie Barlow, has recently completed her who has successfully completed her Advanced Level Apprenticeship in Business Administration. Well done Annie. Great work! Finally, some of you may have been following a twitter story on an international project which our team are working hard on in the works! Whilst we still cannot give away too many details, we can reveal that it is soon to be installed and the summer heatwave here in the UK should have helped acclimatise our engineers who are travelling to the site. Follow our twitter page for more details in the coming weeks!